Each simulation includes directions, master templates and everything necessary to play. Each game covers up to 5 tables of 5 people. Cut each shape and organize into piles of numbers 1 through 5. 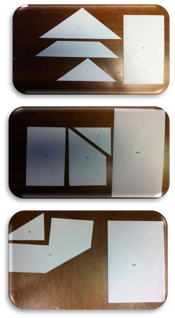 Label envelopes (1 – 5) and place each shape in to the corresponding envelope. Bundle, Paperclip, and include the instructions.